HOBART JONES (g. by So Secret). 4 wins-3 at 2-to 1200m, A$551,050, WATC Karrakatta P., Gr.2, Westspeed 2YO P., LD Total 2YO P., Schweppes H., 2d WATC Book Function at Ascot H., Emirates Melbourne Cup Tour H., 3d WATC Sires' Produce S., Gr.3, Sir Ernest Lee-Steere Classic, Gr.3, Supremacy S., L, Perth S., L, Super Saturday H., Cradle Resources H.
Three Secrets (g. by So Secret). Winner. See below. So Fancy (f. by So Secret). Winner at 1300m, 2d WATC Pat Treby H., Terrace Restaurant H., Minearc Systems H., 3d WATC Past President N Carter H.
Blue Myth (g. by Key Business). 3 wins at 1100m, 1300m in Aust. Jester Reason - Jester Man (Mac.) (g. by Real Jester). Placed at 3, 2d WATC Playeronline.com.au H.
Tribulot. 5 wins. See above. Badminton. 3 wins from 1200m to 2200m, WATC Selangor Turf Club Trophy H., 2d WATC Sister Patricia H., 3d WATC Shamrock H., Hillian H. Producer. OVER THE OCEAN (Regent's Tale). 6 wins from 1900m to 2400m, Newcastle Gold Cup, L, ACT RC Canberra Cup, L, AJC Spring H., Rushcutters Bay S., STC Mill Reef H., Hurlstone Park H., 2d Sydney Turf Club Cup, Gr.3, STC Rosehill Cup, L, Parramatta Cup, L.
Atlantic Mission (Atlantic Flyer). 7 wins-3 at 2-at 1000m, 1200m, A$146,630, AJC Chicola H., 2d Queensland Guineas, Gr.2, BATC Courier-Mail Classic S., L, STC Festival H., L, BATC Sprint H., L, 3d AJC Light Fingers S., Gr.3. Producer. Power Plan (Power Symbol). 2 wins at 1400m, 2400m, SAJC Sunsmart H., 2d Oakbank RC Onkaparinga Cup, L, SAJC Lockley's Tradition H., Hero Wind H., ABCOS H., Price Waterhouse Coopers H.
JUNGLE COMEDY (Jungle Boy). 7 wins-2 at 2-to 1400m, A$134,500, WATC NJ Way S., L, Goodwood Sprint H., L, Winning Goal H., 2d WATC Beat Diabetes 2 S., Gr.1, Western Australian Guineas, Gr.2, Farnley S., L, Ascot S., L.
MISS COMANCHE (Opera Prince). 18 wins to 1300m, A$371,760, AJC June S., L, 2d AJC June S., L, BATC Sprint H., L, Clarence River JC Ramornie H., L, 3d AJC Hall Mark S., L, Qld Tatt's RC Mercedes-Benz S., L. Producer. Race Record: 9 Starts 1-4-0 A$121,000. 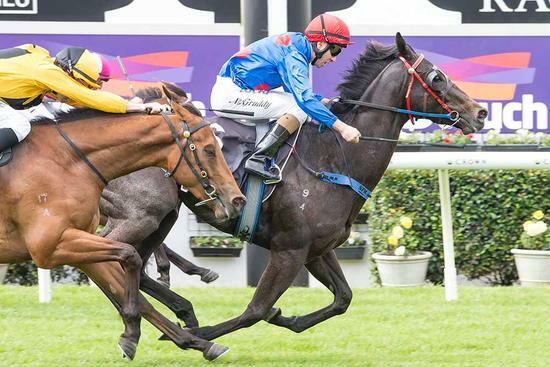 Winner at 1500m, A$121,000, in 2017-18, WATC Tabtouch P., 2d WATC Amelia Park Beef H., Tabtouch H.-twice, David Gray's Aglink H.